Courtesy of Chirag Patel, Mumbai, India. The Gateway of India is a monument located on the waterfront in the Apollo Bunder area in South Mumbai, overlooking the Arabian Sea. 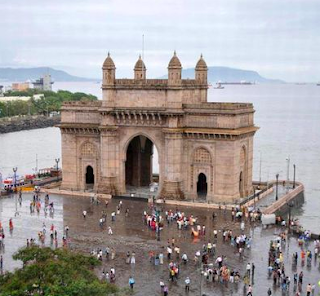 The Gateway to India Challenge is a 35.3 km marathon swim that goes through Mumbay Bay in India. Chirag Patel reported on much shorter races that are organized by The Sea Hawks and sanctioned by Swimming Federation of India at the Gateway of India: Aquaman 2.0 and Aquaman 5.0, 2 km and 5 km sea swims from the Sunk Rock to the Gateway of India on March 24th. The race has a boat start and a land finish.